Long puts provide an opportunity for the buyer to profit if the price of an Underlying asset or commodity falls since they can Exercise their option and sell the Underlying for more than it is currently worth in the market. Long puts are normally used as a form of insurance or a hedge to protect against unexpected falls in the price of an instrument like a stock. Puts can also be used for speculative purposes. 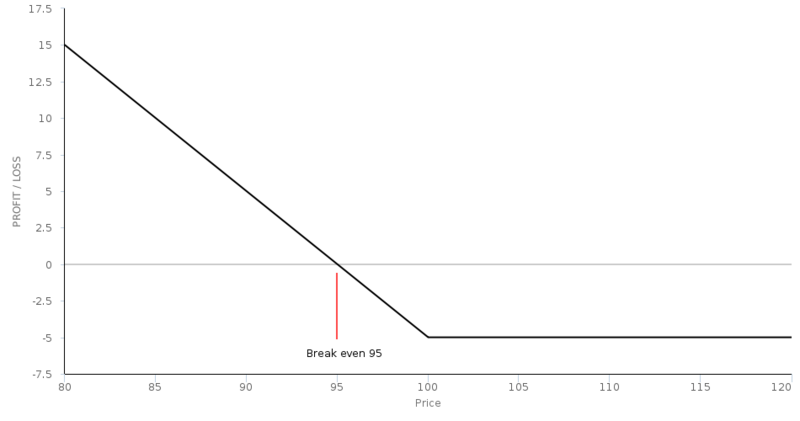 The Delta of a Long put offers a form of leverage because the price of the option may be less than the Underlying asset (considerably so in the case of Out Of The Money puts) but the price will fluctuate partly based on its value. Long puts are not necessarily an ideal instrument for speculation because of the Theta decay features of all Options. Theta has the effect of reducing the value of an Out Of The Money option. Single Long calls and Long puts are the simplest option strategy. They have defined risk because no more than the price of the option when the trade was entered can be lost, however, because the entirety of a trader's capital fall in value to nothing if they expire Out Of The Money they cannot be considered low risk. Break even: $500 to enter, option is worth $500 at Expiration.